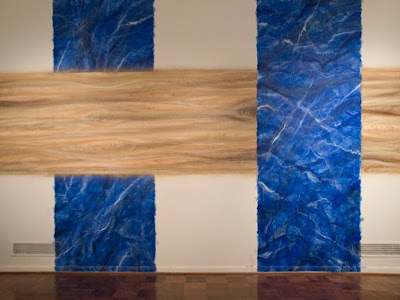 Pulido's sight-specific installation at AMA, Lapislázuli en pintura al temple v/s Pino Melis en esmalte spray (Lapis Lazuli in Egg Tempera vs. Knotty Pine in Spray Enamel), juxtaposes materials, paint, and what is painted - emphasizing the materiality of the work with its capacity for illusion. By contrasting a marble texture made with a material that dates very far back into history (egg tempera) with a wood texture made with contemporary media (spray paint), Pulido creates a dialogue between classical and modern forms of art and the materials used to make art. Gerardo Pulido (b.1975, Santiago). Pulido holds a Ph.D in Art Education, from the University of Seville, Spain, a Master’s and a Bachelor of Arts Degrees from the Catholic University of Chile. He joined the RIAA residence in Argentina. His work has been exhibited throughout Argentina, Australia, Brazil, Chile, Colombia, United States, England, and France. 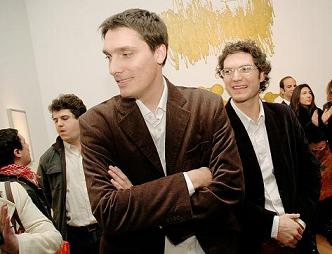 Among his main Exhibitions are Tectonic Shift: Arte Contemporáneo de Chile, Saatchi Gallery y Philips de Pury, Londres (2010); Flujo. Obras de Gerardo Pulido y Tomás Rivas, MAVI, Santiago (2009); Sur Scène, Castillo de Tours, Tours (2007); Políticas de la Diferencia: Arte Iberoamericano de Fin de Siglo, MALBA, Buenos Aires (2001). 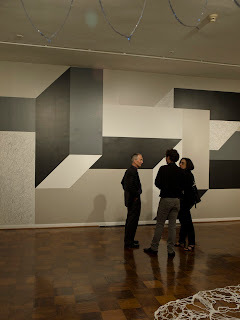 Pulido represented Chile on the 1st competition of Golden Arches of Latinoamerican Painting (Argentina -Colombia, 2010). He has also received numerous scholarships and awards such as the AMA (Chile, 2008); Fondart, CNCA (Chile, 2006); Scholarship MAE, AECI (Spain, 2005-2003). 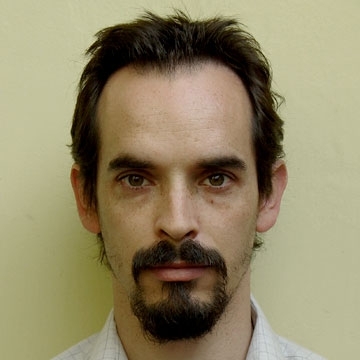 He has published several essays on art and is the Co-editor of Index, Paper Art and Criticism (2001-1997, Chile). Pulido teaches at the UC Art Schools from the Universidad del Desarrollo and Universidad Diego Portales. Rodrigo Galecio's piece, Zig, is a work of geometric abstraction in which perspective and dimension have a really important role. It creates illusions of volume that is read as an axonometric drawing. 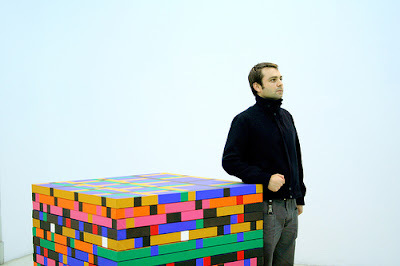 Rodrigo Galecio (b.1972, Santiago). Galecio holds a Master’s Degree in Fine Arts from the Complutense University of Madrid, Spain and a Bachelor of Arts, from Pontifical Catholic University of Chile. His work has been exhibited in Australia, Chile, Spain, United States, and London. Among his most significant work we find the HCO Tribute to Carlos Ortúzar, at Galería Die Ecke Arte Contemporáneo, Santiago (2010); Beuys y más allá, Educar como arte, (MAVI), Santiago (2010). Material Ligero, Five Artists from Santiago, Chile Travelling Light, at the Margaret Lawrence Gallery in the Victorian College of the Arts, The University of Melbourne, Melbourne, Australia (2009); ZABRISKIE POINT, Galería Die Ecke Arte Contemporáneo, Santiago (2007); El Efecto Pedagógico, Tribute to Eduardo Vilches, National Council for Culture and the Arts, , Valparaíso (2006); 5ª Bienal de Artes Visuales: Utopías de Bolsillo, MNBA, Santiago (2006); CONDOROS/MISTAKES, Galería de Arte Gasworks, Union Walk, E2, Londres (2005); Transformer, Centro Cultural Matucana 100, Santiago (2005); To be political it has to look nice, Galería APEX, Nueva York (2003); PAC, Galería de Arte Metropolitana (GALMET), Santiago (2002); Video Biennial Iva Colleges and Schools, Reina Sofia Museum, Madrid (1999). He has twice received the Scholarship for Development and Artistic Creation V.R.A.I.D. from Pontifical Catholic University of Chile (2006, 2008). Galecio teaches at the Pontifical Catholic University, School of Arts. Rodrigo Canala's sight-specific piece entitled Banderines Vacíos (Invisible Banners) are constructed out of PVC and coated in silver glitter. The flag-shaped banners hang in the doorways separating each gallery on the ground level of the museum and are reminiscent of ornamental, festive decorations. The piece is purposefully subtle and can be sometimes unnoticeable to the viewer - playing with the notion of invisibility - which begs the question "how much art needs to be in art to be art?" Rodrigo Canala (b. 1972, Santiago). Canala holds a Master’s Degree in Visual Arts from UCh, a Bachelor of Arts from UFT, Santiago, and has a background in architecture from UVM, Viña del Mar, Chile. His work has been exhibited in Australia, Brazil, Colombia, Korea, Chile, Spain, and the United States. Among his most significant exhibitions are Destellos Negros, Galería Centro, Talca (2011); Contaminaciones Contemporáneas, MAC USP, São Paulo (2010); Material Ligero: Five artists from Santiago, Chile travelling light at the Margaret Lawrence Gallery, VCA, Melbourne (2009); Suite-Patrón, Galería Die Ecke, Santiago (2007); Stgo/Bog/Stgo. Envío de Arte Contemporáneo Chileno, Galería Valenzuela Klenner, Bogotá (2007); 5ª Bienal de Artes Visuales, Utopías de Bolsillo, MNBA, Santiago (2006); Arte Contemporáneo Chileno: Desde el Otro Sitio/Lugar, MAC, Santiago y NMCA, Seoul (2006-2005). Canala has received multiple awards and scholarships including a nomination to the AMA scholarship, the Gasworks International Residency Programme (UK, 2010); nominee to Award of the National Arts Altazor (Chile, 2007), Fondart, CNCA (Chile, 2009, 2005, 2004, 2003, 2000, 1999); Recipient of the Friends of Art Scholarship (Chile, 1999). Canala teaches Sculpture and Volume at the Schools of Fine Arts at UFT and UNAB.